Scrolling down, you can find the abbreviated English version of this Blog. Are you doing fine in this hot weather? The summer break has begun, so we won't have practice this week. Just before the summer break, we practiced matches, didn't we? In the fall, we are planning to have the Col-ken Cup (Columbus JLS Kendo Club Tournament) and the Johnson Cup (presented by ECUSKF). 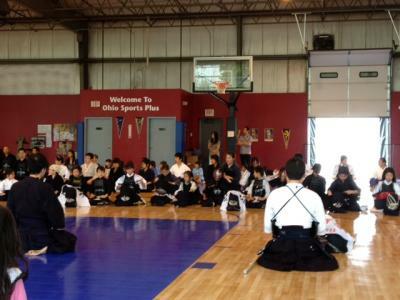 Today's blog will show you how you are supposed to play in a Kendo match. The size of the court for the match will be a square or a rectangle with a side length of 9 to 11 meters. Normally, an individual match is a 5-minute-long 3-points combat, and the one who got the first two points of valid striking and thrusting (Yuko-datotsu) will win. "Yuko-datotsu" means an accurate and intentional striking or thrusting regarded as valid, so-called "Ippon." The time length for a Kendo match can be 2 to 3 minutes in cases of elementary and middle schoolers. If none of the two competitors seems to win within the specified period of time, the one who has got one point will be the winner. Right before the match begins, the competitors will stand outside of the edge of the court doing sage-tou (lowered sword position on your left side), facing each other. Then you get into the court, face each other, and bow while keeping your sage-tou. Then you hold your shinai at the tai-tou position (at the level of your belt), take three steps forward to the starting line. Just when you take your last (the 3rd) step, you get your shinai out, point it at the other's throat and do son-kyo (squatting down on your heels). Wait for the Judge's first call. As soon as you hear the Judge's call, "Hajime! (start! )", you stand up and start the match. When you made a Yuko-datotsu, the Judge will announce, "Men (, Kote or Do) Ari!" to let you know that it was a valid strike. When either of you made a Yuko-datotsu, or when the Judge calls "Yame (stop!)" to announce the end of the match, both competitors will go back to the center lines holding shinai to point at each other's throat. When the match is over, you wait at the center line for the Judge's announcement about the match result (win, lose or draw), and then you make son-kyo and put back your shinai on your left side. Then stand up and make tai-tou, take five steps back, do sage-tou, and bow. Scoop back to go out of the court, while keeping looking at the other player. Next time, we will look into Yuko-datotsu on this blog. See you a week later! We meditate before and after practe in kendo.